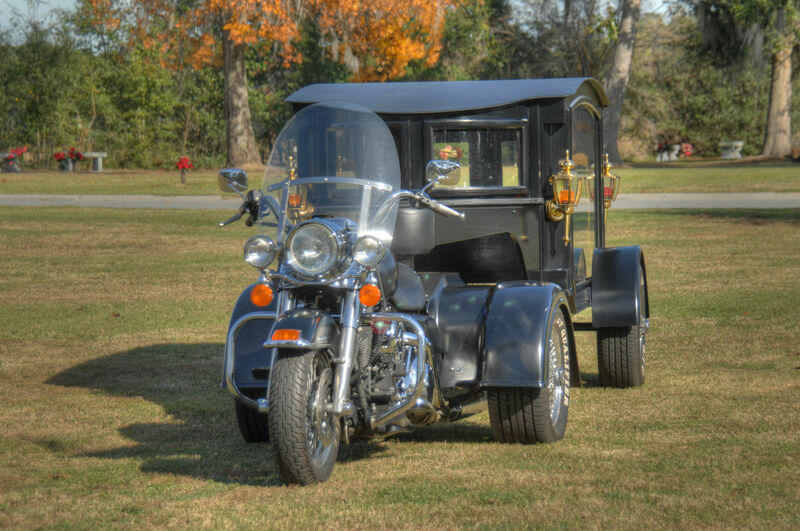 Memorial Properties’ Tombstone Hearse Co. offers services for an alternative farewell ride for the motorcycle enthusiast in your life with our Harley Hearse. Within 48 hours notice, we arrive at your service dressed in traditional motorcycle gear that exudes a nostalgic style and class, while adding a sense of dignity and professionalism, as we take the departed on their final journey. We commemorate the spirit of the open road by creating timeless and lasting memories for family and friends to cherish long after their loved one has passed. We are different from the typical trip straight to the final resting place. Instead, we take the time to go on a favorite road, or pass a sentimental place in order to make our service more personal and different from the rest. If you are looking for a unique way to be sent off on your final journey, call Memorial Properties at 1-888-662-9600 to learn more about this unique option.